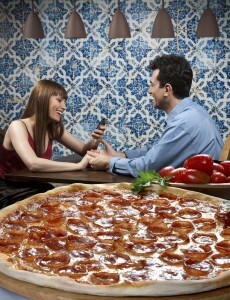 Consider three reasons why going out for pizza is a good choice for a first date. The first date is a big deal. It can also be an awkward experience, even for two people who really like each other. Going to a fancy restaurant may be a good way to impress, but it also raises the pressure. Pizza is a bit more upscale than fast food, so it just may be the ticket. One of the reasons pizza is a good first date option is because it doesn’t break the bank. On the same token, it doesn’t come off as cheap either. Going to an expensive restaurant turns up the heat because if the date doesn’t go well, you just spent a lot of money for nothing. If you go for pizza and the date doesn’t go well, you’ll still have leftover pizza. Pizza seems to make people comfortable, and pizzerias are a good place to eat. It’s easy to sit back in a booth, enjoy a soda or a beer and talk. People get to know each other better in a comfortable environment, so instead of worrying about making a good impression, you can just relax and be yourself. This makes a far better impression than trying to show off. Maybe the best reason to go for pizza is because it makes the whole date easier. Everyone loves pizza, and if you can’t agree on the toppings, you can order a pizza half and half. Even the best restaurants can be hit-and-miss with their food, but it’s hard to mess up pizza. If you’re going to have pizza for the first date, go for the best pizza in Las Vegas because first impressions do count for something.